Thoughout the month of March, as Japan`s mass media reports the daily progress of the CHERRY BLOSSOM FRONT across the Japanese Archipelago, those of us living in the Kanto Area ( around Tokyo) anticipate our local sakura trees bursting into bloom (usually sometime in April- but this year in late March) by enjoying SAKURA MOCHI during tea breaks, at work or at home. 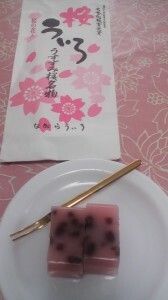 These are sweets which consist of smooth, pink colored patties (made of wheat flour)which are gently folded around a dab of sweet bean paste ( anko). Importantly, a young cherry tree LEAF which has been lightly salted, is then wrapped around this ( the leaves have been picked during the previous year, of course). 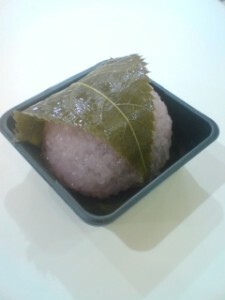 I was surprised a few years ago, when a friend, born and raised in the Kansai Area ( around Kyoto and Osaka), and who had just come to live in Tsukuba ( in Kanto), had NEVER SEEN such a sakura mochi before. 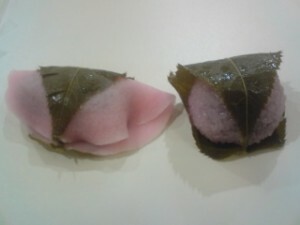 The fact is that in Osaka, what they call sakura mochi is ALSO a sweet wrapped in a cherry leaf. Their’s, however, is round, and made with sticky rice which has not been pounded smooth, so that each grain is clearly visible. These are called DOMYO- JI outside of Kansai ( and they are available at some shops in Tsukuba). 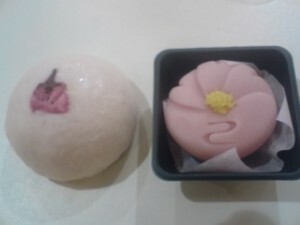 Still more surprising was to find out that many WAGASHI-YA ( traditional Japanese sweet shops) stop selling sakura mochi with the onset of April, when the sakura trees actually start blooming around here- eating these sweets had been an act of anticipation for the coming blossoms! 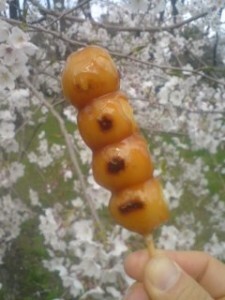 The most traditional sweet actually taken to cherry blossom parties has long been HANAMI-DANGO. Sticky and chewy little balls ( four or five of them) skewered on a stick. Generally speaking, dango are made out of pounded grain, boiled or roasted. There are many types of these dumplings, depending on the time of year and the region, and they are available throughout Japan all year round. Dango are the simplest and most rustic ( you could say primitive) of all Japanese sweets, making them perfectly suitable for Japan`s most ancient customs- cherry blossom parties and moon-viewing ( for which Tsukimi Dango are offered to the moon). It is popular. 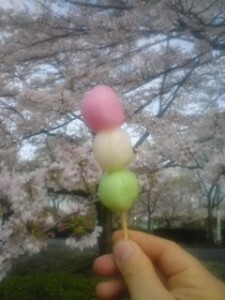 however, in the cherry blossom season, to find three-colored HANAMI-DANGO at convenience stores and supermarkets. The colors represent the blossoms- pink, the fresh foliage of spring- green, and most importantly, SAKE- white! MITE NO MIYA HITO NI KATARAMU SAKURA HANA TE GOTO NI ORITE IE TSUTO NI SEMU ( 見てのみや人にかたらむさくら花手ごとに折りて家つとにせむ）- which means- the blossoms are so beautiful that I`d like to break off a branch to take home with me. As actually doing this would be very bad form indeed- almost sacreligious, what better surrogate for the blossoms than taking home the beautiful cherry shaped and motifed wonders created by Japans imaginative confectioners. They taste good too. But dont forget that these sweets are made to go with green tea and not coffee, so make sure you have some when you get ready to eat them. 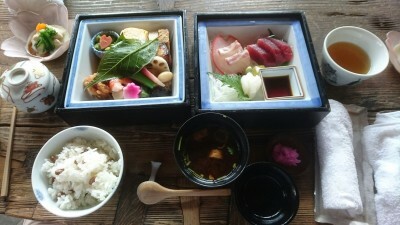 In Tsukuba there are MANY great spots for it. 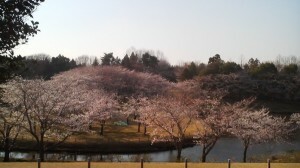 But if you have no time here in Kanto, remember that the CHERRY BLOSSOM FRONT will continue its progress northward. You still have some time to catch the blossoms at some of Japan`s most famous cherry spots, including Kakunodate in Akita and Hirosaki in Aomori. One more thing about the dango skewered on a stick that I cant resist pointing out. Though during the cherry blossom season there are the colored HANAMI DANGO with three dumplings on a stick, in Tokyo, for most of the year, there are FOUR on a stick, and in Kyoto FIVE ! 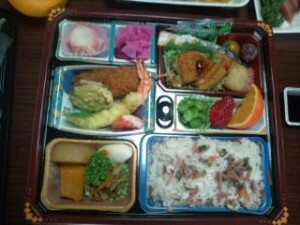 Here is an example of a BENTO ( lunch box) especially prepared for a cherry blossom excursion. Note the cherry flavored rice! 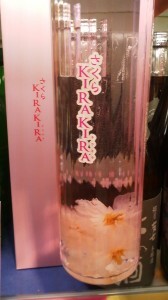 The perfect lubricant for Hanami- SAKURA KIRAKIRA- a brand of sake (rice wine) with real cherry blossoms soaking inside! When the day was done, I had a good case of HANA TSUKARE (花疲れ), literally Cherry blossom fatigue, an expression which has actually become a haiku key-word ( KIGO). You can imagine the ladies of the old Heian Court ( in what is now Kyoto), who rarely left their quarters, getting all dressed up for a days outing to party all day under the wild cherry blossoms. They must have gotten tired out indeed! In a few days as the blossoms get passed their peak each gust of wind ( or breeze) will bring about a HANA FUBUKI ( cherry blossom blizzard), which sometimes can get quite violent. 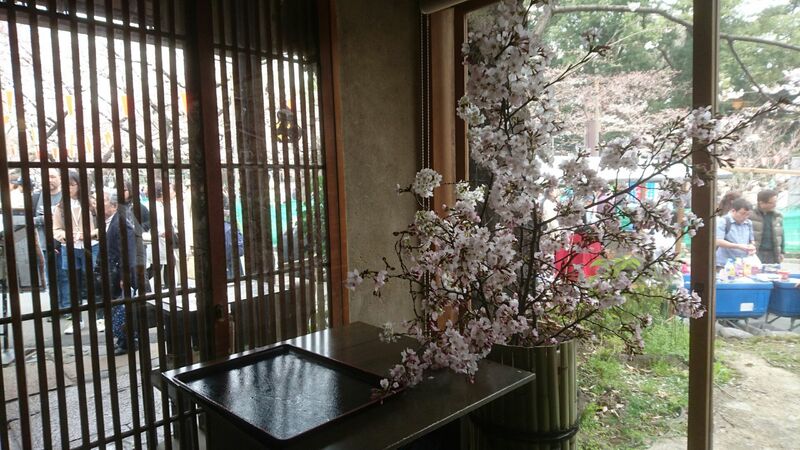 Naturally, whe this happens there is a general feeling of regret (OSHIMU) as the beautiful blossoms falling away. 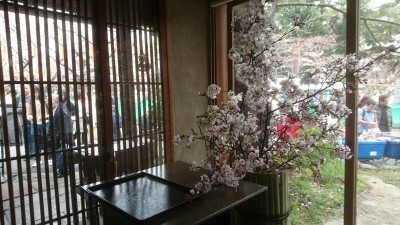 But there is also a sense of continuity, with all the memories evoked of HANAMI past and dreams of those in the future. CHERRY BLOSSOMS-So many mem`ries come rushing back ! Watching the HANAMI revellers (mostly foreign tourists!) pass by from inside INSHO-TEI an old restaurant located inside Ueno Park. Do the Shikoku Eighty-Eight Temple (O-Henro) Pilgrimage Circuit- Right Here in Tsukuba!